The 2016 Subaru WRX improves on everything to love about sport compacts: fun factor, frugality, and functionality. 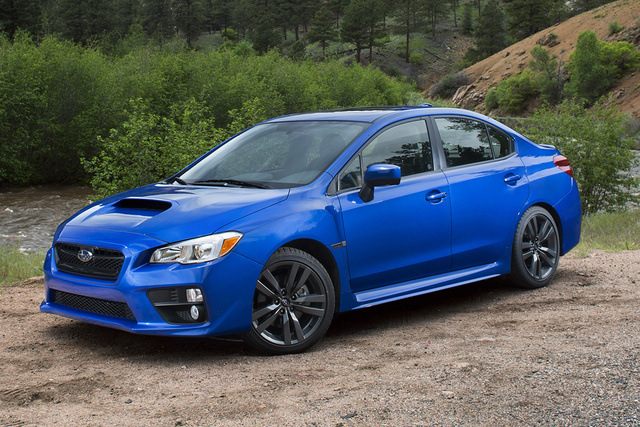 The 2016 Subaru WRX is a price-for-pound powerhouse in the sport compact category. The car's racing inspiration is evident in its turbocharged plant that rockets the car to 60 mph in 5 seconds, and its supremely tight setup is confident at any speed. Don't be confused, though: Although Subaru's car is named after its 1990s World Rally Championship cars, that's all history by now. What's left is a comfortable commuter with a serious wild side. The Subaru WRX isn’t the world’s first sport compact sedan, but it sure seems like a perennial powerhouse and favorite. Alongside the Ford Focus ST, Volkswagen GTI, and outgoing Mitsubishi Evolution, the WRX is a heat-seeking, fun 4-seater and an all-out blast to drive. 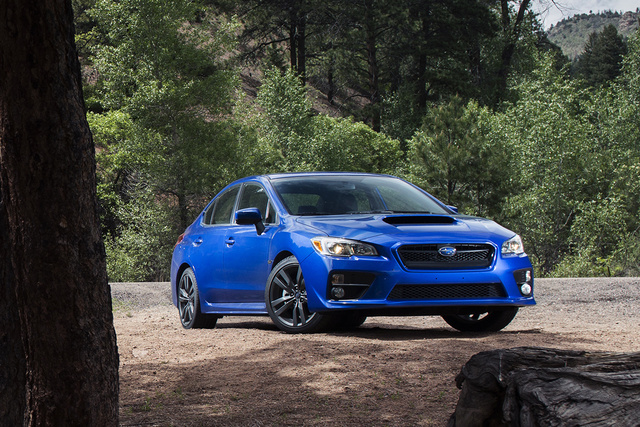 Redesigned in 2015, this year’s WRX retains all the creases and sheet metal from last year. Included in last year’s complete overhaul were a new nose, a deeper chin, a wider track, and a more aggressive hood. This year’s exterior improvements are confined to available 18-inch wheels and an upgraded infotainment system. Not included in last year’s overhaul was a 5-door hatchback, and the mountain-states staple won’t be around for this year, either. The WRX is offered in three trims: the base WRX, WRX Premium, and WRX Limited, which all sport the same 2.0-liter turbocharged flat 4-cylinder engine and all-wheel drive (AWD). Higher trims include creature comforts such as a sunroof and leather seating and offer an available continuously variable transmission (CVT). 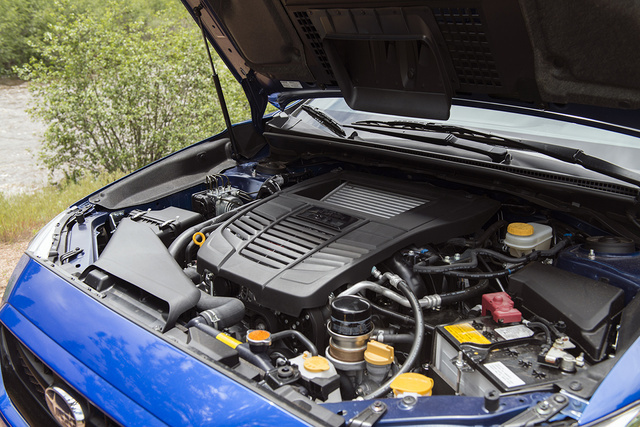 The WRX is all about performance, and there’s a lot to cover. Its 2.0-liter turbocharged four has a smaller displacement than the previous generation, but it's rated at 268 hp—3 more than the last generation—and 258 lb-ft of torque—14 more than the last generation—with minimal weight gain. The engine is mated to either a 6-speed manual transmission or, in Premium or Limited versions, a CVT automatic. The manual offers precise throws for people willing to row their own and adds one more cog than the Impreza’s base 5-speed manual. The CVT is serviceable and comes with paddle shifters for simulated gear changes. All WRX models are fitted with Subaru’s Symmetrical All-Wheel Drive system that moves torque and grip around all four wheels. The system is slightly different with the manual versus the CVT, but both are equally effective at holding tight corners. Although the WRX STi (Subaru dropped the “Impreza” prefix last year from both models) has traditionally been the faster of the two performance models, the WRX is no slouch. Under ideal conditions, the WRX rockets to 60 mph in around 5 seconds, although most people will touch 6 seconds without much of a sweat. The lower, wider WRX is keen to keep grip as long as your courage will allow, and the stiff chassis darts and dives into corners without blinking an eye. Car and Driver measured the WRX’s lateral grip at 0.95g, which is impressive for a car that comfortably carries 4 people in day-to-day work. Power comes on early in the WRX’s band and stays there. The turbo surge kicks in at 2,000 rpm and lasts nearly to the engine’s 6,000-rpm redline. Driving the WRX between 3,500 and 4,500 rpm is entirely agreeable, and the throaty dual exhaust in back resonates with a flat-four warble that’s aggressive without being annoying. If you’re careful, the WRX manages 21 mpg city/28 highway/24 combined with the manual, 19/25/21 with the CVT. Push it like we did everywhere you go, and that number dips into the low-20s all the time. If there’s any limitation the WRX has, it’s purely physics. The front-mounted engine can drag its nose into understeer in extremely hard driving, which can be mitigated slightly with experience and an even temper. Subaru’s AWD system can correct some understeer, so long as the driver stays off the brakes. It’s a harrowing experience for anyone who’s not familiar, so our best advice is to ease into the WRX’s handling. The Subaru WRX fits into a long line of sport compacts that are equally fun to drive and useful every other day. The sedan—there’s no hatchback this year—comfortably fits 4 adults (with 35.4 inches of rear legroom) and fades into a comfortable commuter. The 12.0 cubic feet of storage in the trunk is usable (although there is still no trunk-mounted release—it’s on the key fob or by the driver’s knee), and the 60/40-split rear seats fold down for extra space. The WRX is remarkably poised and confident on the road thanks to high-strength steel components in its chassis. Wind noise is kept at bay, and although the engine’s competent warble is heard at higher revs, very little road noise makes it through to the cabin. 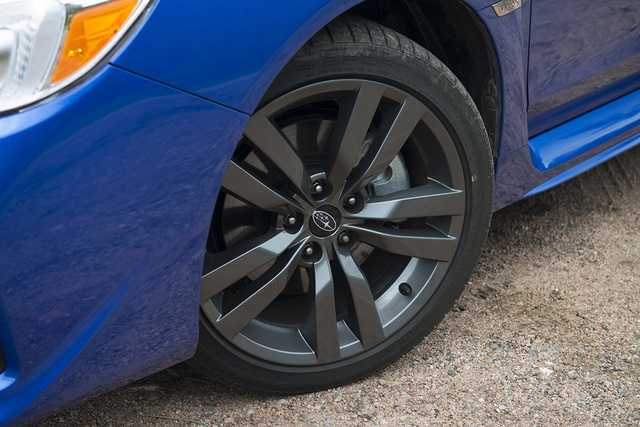 The WRX’s bigger brakes (12.4 inches up front, 11.3 in the rear vs. the Impreza’s 10.4-inch rotors) help stop the WRX in a hurry. The Subaru’s brakes are as grabby as, say, the Focus ST’s anchors, but the WRX’s brakes stay firm and consistent throughout. The chassis is also remarkably flat during hard braking. Like most cars, the WRX uses electric-assisted steering to control direction. Subaru’s formula is pretty good, and there’s a significant weight difference between the car’s normal and sport modes. For this year, Subaru inverted the front struts to accommodate its larger wheels. 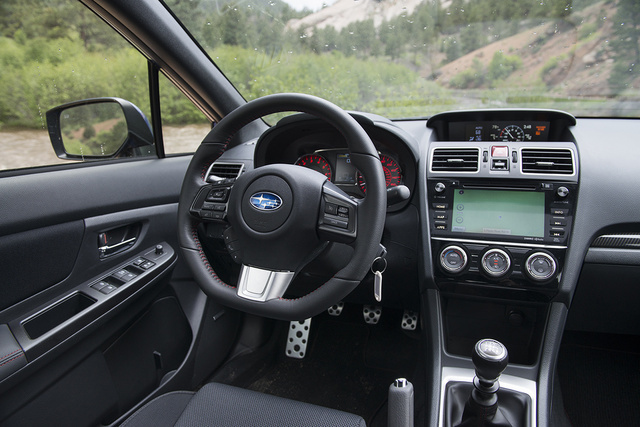 New for 2016, the WRX receives Subaru’s 6.1-inch touchscreen infotainment system making the rounds in its other cars. 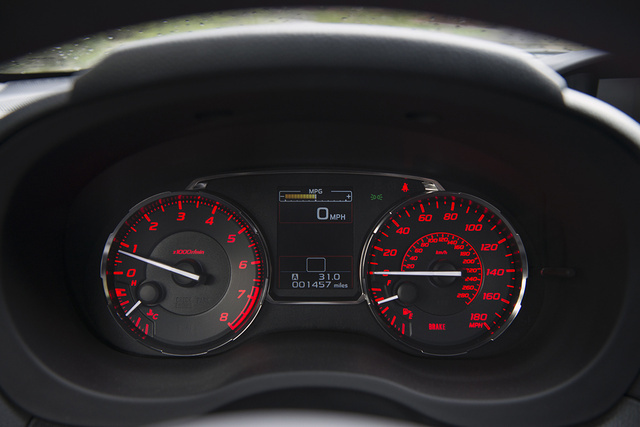 The WRX also sports a 4.5-inch multifunction display above the dashboard that can display fuel efficiency, boost pressure, and basic car information. Available options include a premium 9-speaker Harman Kardon stereo, navigation, and remote start. The interior is nice, but a little plainer than others in its class. The all-black seats don’t offer much to look at around the cabin, and the optional seat heaters are still awkwardly placed. Although Subaru’s approach is different than VW’s or Ford’s, the interior of the WRX is still comfortable and a nice place to be for long trips. Despite being a relatively low-slung sports car, getting into the WRX doesn’t cause you to break a sweat. Its higher hip position helps improve outward visibility as well as entry and exit. In higher Premium and Limited trims, the WRX adds leather and a power driver’s seat. All WRX trims feature Bluetooth phone connectivity and steering-wheel-mounted controls. The Subaru WRX has earned the highest marks from the Insurance Institute for Highway Safety, a Good rating in front and side crashes. 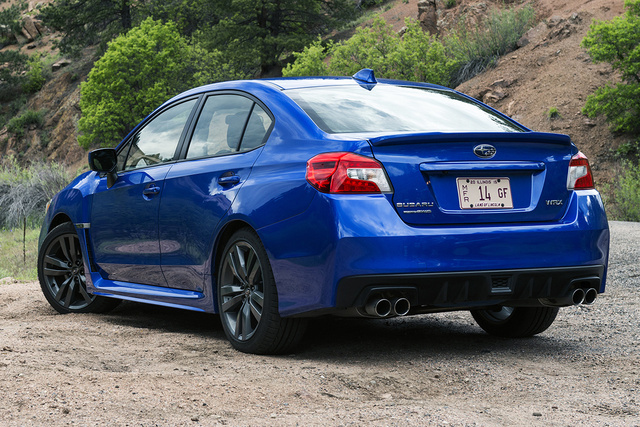 The National Highway Traffic Safety Administration has not rated the WRX. Outside, the WRX uses active torque vectoring in addition to its Vehicle Dynamics Control, which uses brakes to control the car’s AWD system. The WRX features antilock brakes and a reinforced frame system for passengers. Inside, the WRX has standard driver and passenger airbags, side curtains, and a knee airbag on the driver’s side. Last year, Subaru did away with the integrated headrest in favor of height- and tilt-adjustable headrests for better whiplash protection. The WRX only offers EyeSight (a windshield-mounted sensor that includes blind-spot monitoring, adaptive cruise control, and controls cross-path alerts) on models equipped with a CVT, but all WRXs include a backup camera. Starting at $26,595, the WRX is among the most affordable ways to step into a car that is seriously fun to drive. Our tester, a WRX Premium with every option except the CVT automatic transmission (thank goodness) topped out at $32,855 including delivery costs. Subaru consistently ranks high in residual value and was recently honored with Kelley Blue Book’s “Best Brands to Own” over 5 years award. The sedan offers an attractive price (maybe not the most attractive body), but we can’t help but pine for the wagon to make a return to the States soon. It’s hard to argue against Subaru’s WRX as being one of the most affordable, most fun cars to drive, so we won’t. Instead we’ll just drive it. What's your take on the 2016 Subaru WRX? Users ranked 2016 Subaru WRX against other cars which they drove/owned. Each ranking was based on 9 categories. Here is the summary of top rankings. Have you driven a 2016 Subaru WRX?